Arman Ali, a 2014 International Visitor Leadership Program (IVLP) alumnus, has dedicated his life to championing the rights of persons with disabilities in India. The executive director of Shishu Sarothi, an award-winning NGO based out of Assam in north-eastern India, Arman continues to not only empower persons with disabilities through education, rehabilitation, and training services, but advocates for sustained change in the laws governing disability rights in India to promote equality and fair treatment for all. In 1998, Arman garnered national recognition by receiving the “Public Recognition for Outstanding Performance” award by the Ministry of Social Justice and Empowerment in India. Arman was personally awarded this honor by former Indian Prime Minister Atal Bihari Vajpayee for being the most efficient disabled employee in the service sector. Diagnosed with cerebral palsy, Arman has proven that he is neither defined solely nor constrained by his disability. Today, Arman continues to fight for equal rights for persons with disabilities. Through the Disability Law Unit at Shishu Sarothi, Arman has effectively collaborated with government officials, NGOs, and advocacy organizations to develop a new draft law of the Persons with Disabilities Act across seven states in north-eastern India. 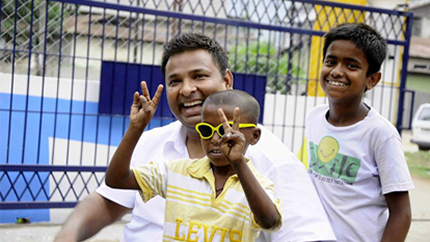 At a grassroots level, Arman continues to assist children, youth, and professionals with disabilities through practical, life-changing activities. In 2010 he organized the first ever job fair in north-eastern India exclusively for persons with disabilities, bringing together more than 22 private sector companies and 350 participants. Every year, through Shishu Sarothi’s Diagnostic Clinic and Outdoor Service Department, Arman helps oversee the provision of home management, counseling, and physiotherapy services to over 600 households who have children and infants with disabilities across north-eastern India. Arman’s accomplishments and sustained dedication are an inspiration for how leaders across the world can serve as catalysts for change in their communities. The International Visitor Leadership Program (IVLP) is the U.S. Department of State’s premier professional exchange program. Through short-term visits to the United States, current and emerging foreign leaders in a variety of fields experience this country firsthand and cultivate lasting relationships with their American counterparts. Arman participated in the 2014 IVLP program on Disability Rights and Issues.